Don your masquerade mask and head to a wild street party in Carnival Queen, a Mardi Gras-themed slot game from Thunderkick. The action takes place using a 6 reel, 4,096 ways to win Avalanche reels game engine. Each successive Avalanche win increases a multiplier. There’s also a bonus round that awards at least 12 free spins complete with wild extras and more multipliers. Play on all devices from between 10p and £100 per spin. The action in Carnival Queen takes place using the Avalanche feature - after a winning combination hits, the successful symbols are removed and new ones drop in and replace them. These Avalanches keep on coming as long as a new winner is created. Each successive Avalanche also increases a multiplier by 1x. After a winless Avalanche, the multiplier resets to 1x. This is known as the Multiplier feature. Landing 3 bonus scatters on the same spin will get you 12 free spins in the Bonus Game feature. Each extra scatter on that triggering spin adds another 4 free spins to your total –you can begin with 24 free spins in total if you’re lucky. Anyway, the gameplay is similar to the base game but there are a couple of extras to note. First, the multipliers don’t reset back to 1x following a winless Avalanche. Second, if you land a losing free spin that features a wild, all of the symbols on the same reel and row and wild are removed and a new avalanche takes place to give you a second bite at a win. You can re-trigger more free spins here too as just 2 bonus scatters will get you another 3 free spins. This samba party is a relatively simple one. The Avalanche reels keep things moving along to a good rhythm though and the expanding multiplier can offer some decent opportunities. The volatility here is in the medium range but there are potential wins of 22,700 times your stake on every free spin! There’s nothing on offer in Carnival Queen that we haven’t seen before. It all bounces along rather nicely though and comes with Thunderkick’s usual design excellence. 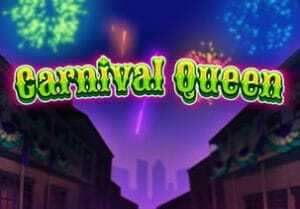 If you’re looking for a party themed slot game then Carnival Queen does the job perfectly well. I also suggest you try Tiger’s Glory (from Quickspin) which also offers big wins.